In the future there will be a leap in the evolution of the Automotive, which means that most of the current predictions will prove to have been naive. 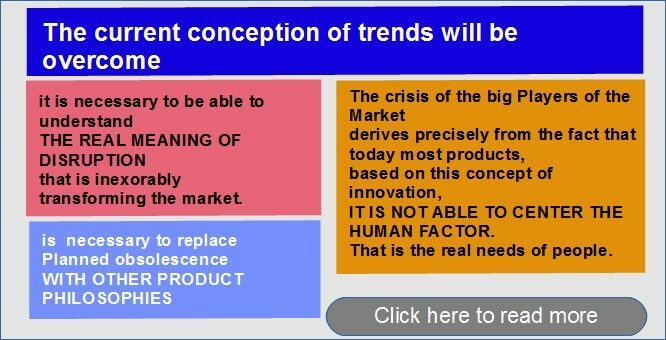 The current conception of trends (seen as a linear progression of the current methods of using technologies) will be overcome (it has already been surpassed by the most successful Start Up). It is therefore necessary to apply a new concept of trends to the strategies. that is inexorably transforming the market. The disruption is precisely that phenomenon that periodically affects the Society (and the Market), which makes the “Civilization of man” a leap forward. Creating a rupture of ways of thinking and organizing the actions (the failure of strategies) used up to that moment. Disruption therefore brings the need to abandon traditional mindset, to be able to adopt a new way of looking at things, reasoning and acting. More specifically, the problem is that the Market is currently based on a conception of linear progress of things. Conception from which a Vision derives, which includes, among other things, the idea that we must develop increasingly advanced technological performances, and a “futurist” innovation as it is in the automotive sector with self-driving cars or flyng cars. IT IS NOT ABLE TO CENTER THE HUMAN FACTOR. That is the real needs of people. (for this reason most of the Big Players’ products are sold with difficulty). – VALUE-IMAGE OF THE PRODUCT: today we bring the consumer to an emotional purchase. The product is a status symbol: the User shows who he is with what he owns (the products are avatars). – GREATER SOPHISTICATION OF TECHNOLOGIES: today the consumer is convinced to change the “old” product with a new version that in reality does not present any new functionalities really useful for him (there are no functional features that justify the expense incurred to replace the product). With this orientation, today incorrect definitions of product innovation are developed, as in the case of futurist conceptions of cars, Self-driving and Flying cars (it is not that the intuition of these types of cars is totally wrong: the problem is that these concepts are developed with an obsolete mindset, and the products thus conceived turn out to be naive, like the “flying carts” in Jules Verne’s novels). ● at the level of NON-DIVULGED STRATEGIES. Today, producers pursue interests that are incompatible with consumer interests. Perhaps the most significant case is that of the strategy of programmed obsolescence (the planning of the “end of life” of many parts of the product) which forces the consumer to quickly replace the product in his possession with a new one. – the transparency developed by the Web channels highlights this aspect of the Market (Post and Youtube videos clarify how today Apple is developing strategies “against” Consumers). Technologies become a marginal issue in disruptive innovation, since they have only the role of enabler; today, low-tech (consumer technology) is more than enough to develop disruptive value solutions. For example, in the Automotive sector the essential elements of the current futurist goals will remain. But the current “science fiction” aspects will be abandoned, to develop products that are more suitable for men and the environment (and therefore effectively marketable). The example of flying cars and self-driving cars shows us (or will show in the future to people today not able to understand) how their current conception derives, among other things, from a myopic vision of the progress of man. In the future it will be clear that today in this case there is an error in the assessment of the innovation typical of the non-risruptive mentality: a problem is identified, and instead of trying to understand how it can be solved at the root – at the level of the causes – we try to solve it at the level of the effects. For example, in the case of flying cars – already operating as taxis in the futurist contexts of Arab cities – we try to solve the problem of urban traffic congestion with hyper-technological solutions. More generally, the naive aspect of the current market, is in wanting to solve problems with the same elements that have produced these problems. An example of alternative orientation compared to the current one, is represented by a new generation of City Vehicle, which makes the concept of self-driving (and also that of Flying Car) sustainable. The same micro-vehicles from the city can be inserted in a very light wing structure, becoming flying for the extra-urban routes. Currently in the market there is the rule of developing product according to Planned obsolescence (“death by design” of the product). That is according to the idea of ​​increasing sales volumes by shortening the life of the product (shortening the “replacement cycle”). Some factors in this product strategy have become a problem for incumbents. This applies, for example, to unsustainable economic cost of these products for Consumers (this is one of the main reasons for the Market crisis: the Planned obsolescence strategy worked in times of economic well-being, but today, in times when consumers can afford to spend much less, such type of products is sold with difficulty. The Planned obsoloscence also has a high economic cost at a social level, since it is an exasperated consumerism of the disposable that involves bulky products, not easily disposable. ALSO THE “ADVANTAGES” FOR THE CONSUMER. In order to understand how the Market must orient itself in order to face this passage, it is necessary first of all to observe how it worked before the current phase of hyper-consumerism based on Planned obsolescence strategies. That is why it is necessary to analyze the time in which almost exclusively Reliable products exist (such as, for example, the first car, the Ford T, or the first “household appliances”). One of the main purposes of the new Model long/endless durability is a real Sustainability and Affordability. – it can be purchased in a minimal configuration, and then gradually implemented with new parts to develop new functionalities. – since the product lifetime of a long/endless durability product is equivalent to many product lifetime of current products, it still costs a small part of a current product at planned obsolescence. Obviously this new philosophy of Product reprresents a major problem for the current market (a “conflict of interests”). ● the change towards new products that drastically reduce the traditional advantages of the producer is not today an option, but an absolute “historical” necessity (ie, it is not a question of an ideological, “idealistic” choice for capture new groups of consumers by elaborating an image of correctness). (it is basically to be in able to adapt to the “rules of progress” of human civilization). Who is not able to follow the new Demand remains out of the market. This rule is the Law of Supply and Demand. It has been at the base of the “Market” for thousands of years, and has been abandoned in recent decades. This departure from one of the fundamental rules of the progress of man is, in fact, one of the major causes of the current crisis – this is true both at the Market level and at the Governance level). The fact that The Repair Association [https://repair.org/] got the law on the reparability of technology products in many US nations, helps us to understand how today a trend is developing, bottom-up, which induces the market to overcome the strategies of planned obsolescence. The market is therefore in crisis because it is no longer able to sell products that provide almost entirely benefits to producers (who no longer respect the Law of Supply and Demand). Basically, it is one of those phases of disruption of human history in which progress makes a leap that creates a discontinuity in its ordinary linear evolution. In this case the leap brings the Market to pursue the Demand, the real needs of the people. Which means a recovery of product quality now lost as affordability and sustainability. To achieve these goals it is necessary to recover some characteristics of the typical products of the market phases prior to the current one, as is the Modular architecture. One of the problems of current products that encounter difficulties in sales is their Integral architecture (ie they are created as “one piece”, in which the components can not be replaced). The integral architecture presents many advantages for the big Players of the current Market, since this structure of the product, among other things, drastically lowers production costs. And it allows developing a “planned obsloscence” (a “death by design” of the product) that forces consumers to continuously purchase new versions of the product. It is also important to note that products based on Integral architecture are only convenient for large-volume production (design is complex, and the means of production are very expensive) and therefore only the great Players on the market can offer this type of product. product. The modular architecture was typical of the products of the Market before Planned obsolescence (of the Market before the 70s). The “technological” products since the early twentieth century are all based on modular architecture (such as the first car, the Ford T, or the first “appliances” that were totally modular; in them there was not even partial integration between the components). One of the most significant examples of modular product is the PC consisting of a “frame” that houses independent components (a product that can therefore also be produced by small assembly laboratories). The transformation of the modular model of the PC into a product with integral architecture by Apple is one of the most significant examples of how this type of architecture can drastically reduce the useful qualities for the User in a product (and how this transformation became at a certain point in a boomerang for the producer). In fact, Apple, creating a “disposable” product (characterized by a real value that does not justify the expense) has been forced to propose sales strategies strongly based on the product’s image-value. And this has worked for a few years, but the high cost for a product “status symbol” is no longer sustainable in times of crisis, in which people are forced to fall back on really useful products. Anyone who has bought an Apple product knows that soon one of its components breaks down, and one hears from the assistance service that the repair costs more than the purchase of a new version of the product. One of Apple’s “masterpieces” in this sense was the mini-Mac. But the most important point of the Apple strategies is represented by the band of the professional Macs, whose new generation is based on an integral architecture. This is obviously incompatible with a professional use of the computer (the professional needs to upgrade, according to his specific needs, some aspects of the instrument). Following this move Apple professionals began to use normal PCs on which they install clones of the Apple operating system (the paradox in this case is that many professionals would also have paid the high price of Apple products if they could customize it with the appropriate cards ). Compared to Apple products, the PC has remained a substantially modular product, which can easily be repaired, upgraded and upgraded according to the user’s personal needs by replacing or updating only one component. The current market has also managed to create strategies of planned obsolescence for the PC, inventing a periodic succession of new standards not compatible with the past that make it impossible to upgrade the Computers (it is no longer possible to change a single component). ► of the Market: while penalizing the big players (which are in any case destined to succumb to new comers that apply disruptive innovation that go beyond the philosophy of integral architecture), modular architecture allows a revival of the market thanks to the possibility of creating new Business (this type of product requires much simpler production equipment). ► of the Consumer: the modular architecture allows a customization and an upgrade of the features that make the product more useful and affordable for the Consumer. Thanks to the new production methods of the Proximity market (that implies the diffusion of production in the territory), there are lower costs of transportation (“Km Zero”) and intermediation (in Manufacturing 4.0 it will come to the “direct” sale by the producer, with products that can be collected at the factory). Prices also decrease due to the fact that in the new situation there is greater competition. A side benefit of the new product philosophy is that thanks to it we can have a revival of the local economy (a revival of local markets and, obviously, a revival of the market in general). ● price: apparently one of the advantages of an integral architecture product is its lower cost. But soon the consumer realizes that this price is actually much higher than that of a modular architecture product which has a much higher lifetime. ● performance: on paper, the performance of the integral architecture product can be better (if we consider the benchmark of basic products). But in reality, useful user performance can be much higher with modular architecture, as the user can customize the basic product for his specific needs with high performance cards. Regarding the issue of performance, we must take into account that in the current disruptive innovation phase, in any case, “technological” performances are less important, since with disruptive innovation we are able to create much greater functionality with relatively inexpensive technologies (the consumer technologies, today used in the few dollars devices).